Twenty long serving East Grampians Health Service volunteers were recognised at the 14th annual EGHS Volunteer Service Recognition Awards. Awards for five, 10, 15 and 20 years’ service were presented to volunteers. 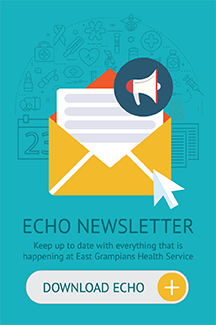 Chief Executive Andrew Freeman said East Grampians Health Service has a proud history of volunteering and today there are over 120 volunteers assisting across the organisation. “I would like to sincerely thank each and every one of our volunteers. You all play a vital role in the success of our health service and our many programs, and without your support some of them would not be able to function,” Mr Freeman said. “Our health service is fortunate to have the most amazing group of people who commit hours of work through volunteering. Your outstanding support assists us in achieving our aim of delivering safe, quality care. Guest speaker at the awards was Worshipful Brother Bill Jones from Freemasons Ararat, who gave an entertaining and informative insight into the Freemasons movement, demystifying many of the misconceptions around Freemasonry. Freemasonry, which has a long history with Ararat and in particular the Ararat Hospital, is the oldest and largest fraternal organisation in the world. With a rich history to draw from, Freemasonry is also a vibrant, modern organisation that has changed with the times. Freemasonry is a worldwide society that has bought millions of people together in a fraternal manner, of all nations, religions, political beliefs, and all social backgrounds. It comprises an estimated 5 million members worldwide with over 8,000 in Victoria alone. Modern Freemasonry traces its organisation to the 17th Century and proudly preserves the traditions it has inherited from those times. These traditions make Freemasonry unique within the community. 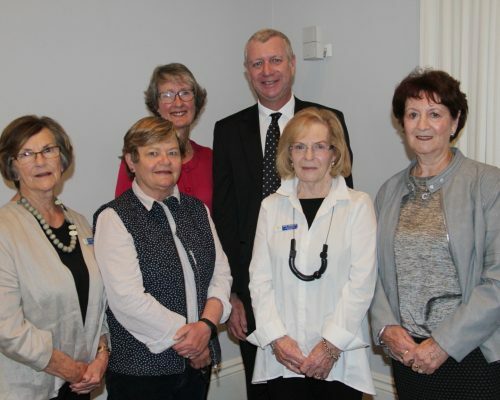 20 year service awards: Heather Fleming, Willaura Auxiliary, Liz de Fegely, EGHS Auxiliary, Val Fenton, Karen Gleeson, Willaura Auxiliary, Irene Shaw, Ark Toy and Activity Library, Leonie King, EGHS Auxiliary, Kathy Tucker, EGHS Auxiliary. 15 year service awards: Kimbra Christie, EGHS Auxiliary. 10 year service awards: Kaye Chamings, Ark Toy and Activity Library, Chris Clark, Residents’ Support Group, Jan Laidlaw, Willaura Auxiliary, Ron Kelly, Oncology, Irene Kelly, Oncology, Helenmary MacLeod, Willaura Auxiliary, John Koenen, Garden View Court, Merylin Wallis, Palliative Care. 5 year service awards: Elaine Richie, Ark Toy and Activity Library, Kaye Felini, Patricia Hinchey Centre, Wendy Roberts, Patricia Hinchey Centre, Robyn Timms, Willaura Auxiliary.